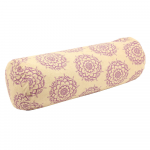 Yoga Bolsters are used to support the body allowing you to relax and stretch without straining. Asanas where bolsters are particularly useful include Adhomukha Virasana (Downward facing hero pose) and Viparita Karani (Inverted lake pose). However they can be used in conjunction with other props to provide elevation, cushioning or support in many other asanas. 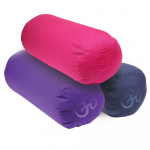 Sand bags are used to deepen postures and to assist in stretching. Please note all our bolsters as well as our zafus & zabutons comply with The Furniture and Furnishings (Fire) (Safety) Regulations 1988, which is a legal requirement for such products being sold in the UK and much of Europe. 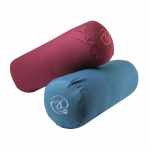 Zafus and Zabutons filled with kapok or cotton batting are highly unlikely to meet this standard and unless they do they technically should not be sold in the UK or used in a yoga studio.